Following a terrifying trend that began in the USA before moving across the Atlantic. Police forces across the country have issued warnings about the potential consequences of the craze, which appears to have been inspired by clown-related pranks in the US. 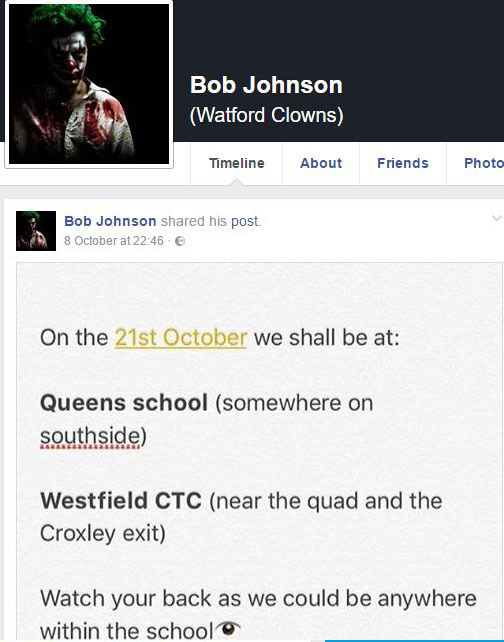 A Facebook page called Bob Johnson (Watford Clowns) warns there will be clowns outside Queens school and Westfield at various times on October 21. On Thursday, October 6 at around 9.51pm, a man dressed as a clown was approaching shoppers leaving Tesco in Jarman Park, Hemel Hempstead. We enquired about getting a costume, read our report here. Caught on video below a Prankster who was scaring shoppers in the street had a bottle smashed over his head.. This follows similar reports throughout Britain. Gloucestershire Police said it had received six reports of clown-related incidents, while South Wales Police has also attended numerous similar reports.